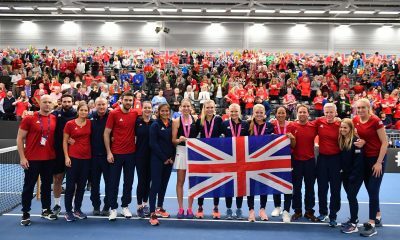 Great Britain beat Slovenia 3-0 in the Fed Cup after Katie Boulter won in straight sets to get them off to a perfect start. Katie Boulter won 6-4 6-2 on her Fed Cup debut to set Great Britain up for a comfortable 3-0 victory over Slovenia in their opening Pool A match in Bath. The Briton, 22, seemed a bit nervous early on as she laboured to her first hold. However, once she settled down, she looked in irresistible form as she brushed aside Kaja Juvan. Boulter took her first break point of the match to forge ahead in game five, and then held serve easily in the rest of the set to clinch it 6-4. The World No.83 then turned on the style in the second set. She served well, finished points clinically at the net and hit a host of superb winners from both wings. 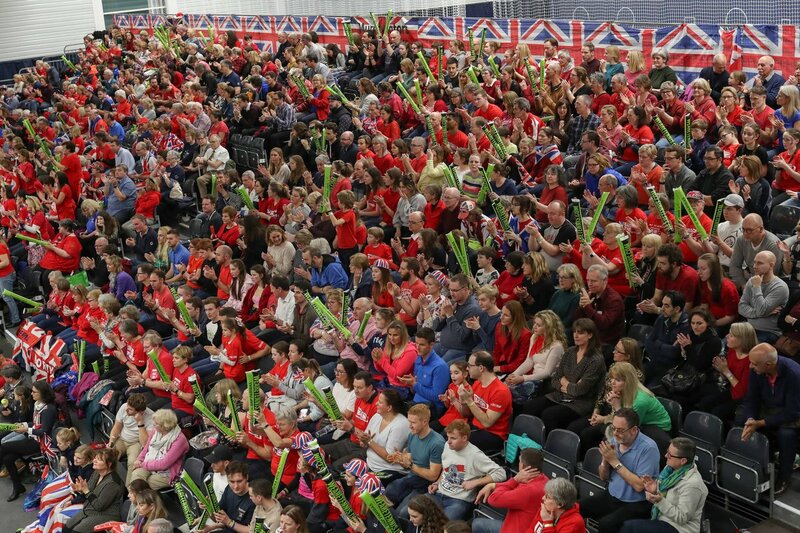 It was the perfect start to the week for Britain, and Boulter beamed as she thanked the crowd at the University of Bath for their raucous support. 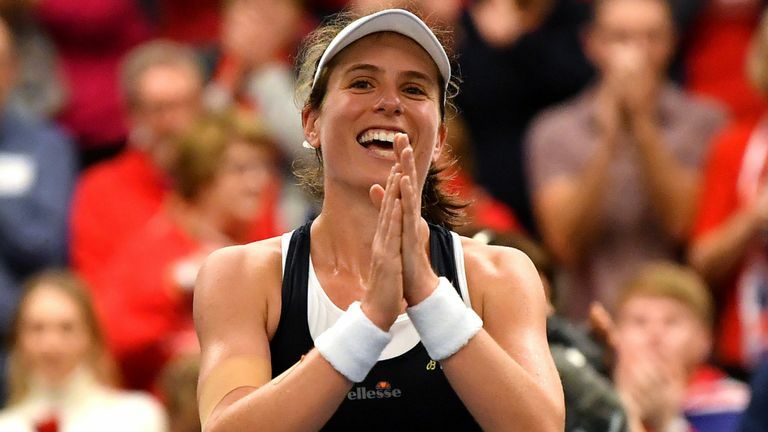 British No.1 Johanna Konta did not make her match against Dalila Jakupovic look so easy. She eventually won 7-6 6-2 after an unbearably tense first set when both players struggled for consistency. In a sign of things to come, the Briton dropped her serve in game three. She then broke back immediately by winning a marathon game that lasted over ten minutes. Konta then moved 4-2 ahead with another break, and the heavily partisan crowd visibly relaxed. However, they were soon feeling uncomfortable again as the Briton meekly surrended her advantage in the next game. The rest of the set was frankly ridiculous, as both players hit some excellent winners and made several puzzling errors. Consequently, there were four consecutive breaks from 4-4 to 6-6 which set up a tie-break. More drama ensued. Konta seemed down and out when she fell 4-1 and 6-3 behind. However, she refused to give in and hustled Jakupovic into a couple of errors to draw level at 6-6. The Slovenian saved one set point at 6-7, but the Briton took her second set point to win the tie-break 9-7. When the higher-ranked player wins a tight opening set, the second set is often much easier for them, and that is exactly what happened here. 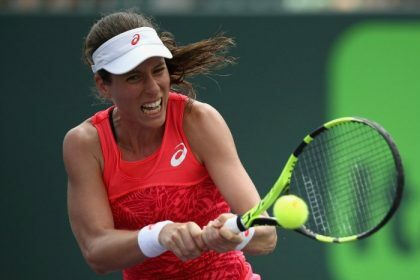 Konta seemed more confident and twice broke Jakupovic to love to lead 4-1. The Serb showed some resistance in the remaining games but it was too little, too late as the Briton wrapped up the set 6-2. With the tie over, Katie Swan and Harriet Dart took to the court to face Jakupovic and Juvan in the doubles. 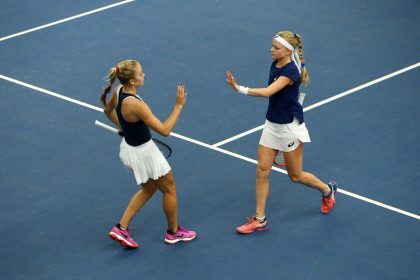 Buoyed by their teammates’ victories, the British pair produced an excellent display to beat the Slovenian pair 6-2 6-2 in just under 90 minutes. 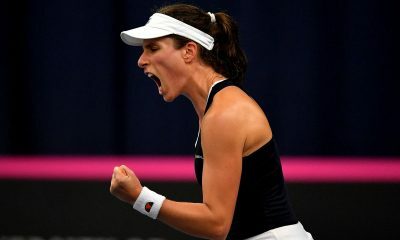 Swan was playing her first Fed Cup Doubles rubber and Dart was taking part in her first Fed Cup match of any kind, but neither showed any sign of nerves as they raced into a 5-0 lead. 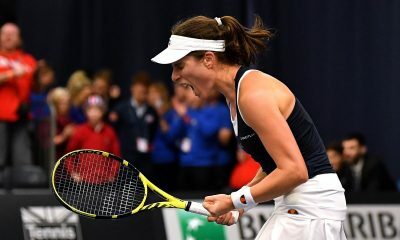 The Slovenians then gained a foothold by winning the next two games, and they briefly raised hopes of an unlikely fightback when they earned two break points in game eight. However, the Britons held on to clinch the set 6-2. The second set followed a similar pattern, as Swan and Dart went a double break up, only for Jakupovic and Juvan to peg them back to 4-2 once more. But the British pair were in no mood for a lengthy set. They broke the Slovenians again and won a lengthy eighth game on serve to finish off the match and the tie.